Cold's Gold Factory - WoW AH & Hearthstone Tips, Heroes of the Storm: Are You A Goblin Or Just A Lowly Kobold? You No Take Big Profits! ﻿ Are You A True Goblin Or Just A Lowly Kobold? It's been pretty evident lately on many World of Warcraft servers that we have a new kind of gold maker trying their luck at making gold in the WoW auction houses of Azeroth. For years the WoW auction house has been dominated by the goblin personas, but recently we've had to deal with a less intelligent, foolish breed of competition invading our markets, the lowly kobolds. Kobold is the perfect descriptor for this new breed of auctioneer. Kobolds are less intelligent goblinoids that tend to fear the other races and are typically just a nuisance, but can be a serious problem when encountered in large numbers. Due to their lesser intelligence, their tactics often leave much to be desired and they often try to overwhelm opponents with numbers, as opposed to using sheer cunning. Kobolds also are known for trading their hard earned resources to goblins for just the basic minimums they need to survive, often bargaining away higher value items for basic necessities. Sound familiar? Every major patch or new expansion release within World of Warcraft is the time for all true goblins to shine. We seek great profits by using our cunning and intelligence to plan ahead and take advantage of major market spikes. That is until some lowly kobolds get in the way and ruin that plan. These dumb kobolds will move into your highly profitable market and undercut you to the ground because of their stupidty and willingness to craft and sell for little to no profit. Some kobolds are so stupid that they will actually sell crafted products for less than the cost of the individual materials! And in today's markets, the sheer volume of kobolds who continue to undercut blindly and drive prices down even lower only add to the problem. There are far too many kobolds in far too many of my markets to be able to buy up everything that they are willing to list for hardly any profits. Then when you do buy up all the underpriced goods, there are even more moronic kobolds there to take their place and continue posting at absurdly low prices. 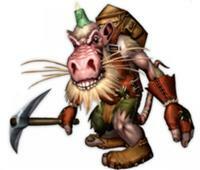 If you think you farmed the materials yourself and therefore they cost you no crafting cost, you are a kobold! If you thinking walling glyphs down in batches of 10s and 20s for only 6-15 gold each is wise, then you too are a kobold! If the demand spiked glyph market is seeing sales at 300 gold or higher per glyph and you decide to post 20 of each glyph at 20g each, then you are a kobold. If you think selling crafted items for less than the sum of the required materials is a good profit strategy, then you are a kobold! With so many kobolds in so many markets post Patch 5.0.4, the demand spike can't handle all of their foolishness. Usually the spike in demand can absorb the lowball prices easily because of the ability to buy them out and just flip their items for the correct prices. Lately the major markets seemed to becoming more and more saturated with so much stupidity that the demand can't keep up. Even my Potion of Treasure Finding Barking Strategy is near useless thanks to the kobolds crashing my market prices from 225 gold per potion (and selling) down to 80 gold per and the prices are dropping daily. The required Heartblossoms alone can barely be purchased for that price! So when you have a horde of kobolds invading the major markets, it's time to fall back onto our niche markets to bring in more for our gold making strategies. That is until some foolish kobold finds out about it and comes and trashes that market too. Maybe a better option is to just hang onto our items that will sell for great profits until after the expansion launches when the even bigger demand spike will be able to absorb more higher prices and more sales volume. Are there Kobolds invading your auction house markets? through a bit of intelligent cooperation we were actually dealing with our kobolds quite well in the first 24 hours of the patch, then one of our goblins changed sides, went totally beserk with a 50g fallback and we've never recovered since. Hopefully the arrival of the expansion will provide too many distractions for the same thing to happen again! Bitter? Nah. As a long standing gold maker, I've grown pretty accustomed to dealing with idiots on the auction house. It's just the flood of morons lately is getting a bit silly. Rock on crafting for a loss! This is what made me drop inscription back when we were still hanging out in Dalaran. I just finished leveling it back up on a new toon Monday night, and Tuesday when the servers came up I was standing there ready to learn the new glyphs. I created them, posted them and all the glyphs I'd made during leveling on the AH - and made a good 10k in the first few hours. Then the kobolds came. The glyphs I'd put up for 300g each, and a few other scribes had undercut by just a copper or two, suddenly became 15g glyphs because an entire crowd of idiots thought that if undercutting by 2 copper is good, then undercutting by 50g is even better! Repeat with the next idiot, and the next, and the next - and suddenly what was selling very well for 300g is now 15g and some are down to 2g. It was a real wake-up-and-remember call as to why I dropped inscription in the first place. The only reason I picked it back up is because of the new achievement of having all 10 profs at max level. While you always have kobolds at the AH they have been worse lately. The saddest part is to see two former goblins turn into kobolds. So far, I've been relatively lucky on my server. There is/was 1 kobold minded person who would go around and blindly post his single glyoh at 25 although all others were 300+. This was relatively not too bad but did make posting a bit slower (just havent figured out how to make the TSM ignore the one single lowballer) which was a little painful. However, during the first night of the patch, he was dusted as the demand was far too great unless he was on there all the time (which he wasn't :) ). Now for the rest of the week, the first wave of folks are already gone but still this wonderboy does his 25g glyph (although I did see some posted at more reasonable prices). Fortunately this mindset has only affected my Inscription market and not the JC market which I still pull in some good cash. Today because I was bored and alt surfing I went on three of my characters (they are all alts to me until MOP starts) and decided to do something crazy. I went to the AH and starting buying glyphs to use, I fairly recently moved to a new server where I started from scratch and my inscriptionist was the latest to 85 so has a distinct lack of glyph coverage. I bought about 5 glyphs each on 3 alts (DK, priest and Mage if you are interested) and I paid the princely sum of 400g. What? No not 400g per glyph, 400g for all 15 of them so yeah there is a distinct problem with Kobolds here. On our EU-server we have a very nasty kobold in the glyph market for some months now. The lvl 1 toon sits in the AH the day long and posts every glyph he has for a "nice" 20 gold. Sometimes in batches of 5, sometimes in 10 oder even more, regardless of the training or crafting costs. We have a cooperation of 4 glyph-goblins that is working very well and we made a decent profit nevertheless so far. Sometimes by undercutting him on weekdays and buying him out after he reduced his prices even more ;), sometimes by camping the AH and reposting in circles even he cannot match. But we have the suspicion that he is not a kobold by himself but an AH bot of some other player who wants to crash our market. Blizz has our tickets by now and we hope to see some change here. The answer to kobolds is preparation and deep pockets. People underprice all the time. Most of the time, I will simply buy them out. I know what I can get for an item in the long run, if I am patient - my cost of goods sold is usually 25% at most, so I make 300%+ on almost everything I sell. Glyphs are a different animal. On Malygos, astute scribes could have bought as many herbs as they wanted for under 20g per stack - yielding glyph costs around 10g. At 20g per glyph, which we see for many of them, that's still a 100% return. Could they sell some for 198g? Yes, but not many. And they can only do it if they join the glyph "rat race." I do not have the persistence or the inventory of my rivals, so I am content to do the simple undercutting and to have a floor above what others mess with. But as some posts here show, if you wall at a low price, you can drive competitors away AND make good money. Seems like a good strategy to me, especially if you just want to lay down the law and walk away for a few days. Today's Kobold is tomorrow's Walmart. Don't assume that your competition is posting below his cost just because it is below YOUR cost. I am not so sure that this is the case as I have been buying up glyphs as low as 1 silver and reselling them for hundreds of gold. How is it possible that the cost to craft a glyph can be that low? Even if you farm the herbs, there still is the time that was spent to farm those herbs, then mill the herbs, and finally get the light parchment and make the glyph. My cost is their cost. It's the cost of lost profit. Do not confuse out of pocket expense as cost. Gathering and crafting professions are seperate professions. Once you gather it, it becomes worth the same as what is conveniently avaialable. Beyond that if you craft with it and post for less than what you could have sold uncrafted it is a loss. Your loss and the person who also wants to sell that item. Kobolds are evil baddies who are intent on ruining the economy. My current method of combatting them is to stop buying from them. I don't reset their trash. Let the market crumble. I still have a million gold and that will not change, but they won't get any either. So all they did was succeed in making the gap between Goblin and Kobold even larger. I just shift to gathering, spread my market out amongst what's still profitable and sell raws and I'm still making more gold. Kobolds are bad. Stop being bad. If you think Kobold=Walmart than you are Kobold. Why are you here? Could it be that the kobolds are not really kobolds, but bots, who now craft and sell goods? While for you farming takes time, for them, it takes very little human-operator time, thus, indeed, making their crafting costs minimal. If for you 10-20g per glyph is a waste, for them, it might be 300-1000% profit. Now add in the sales volume and you get the picture. Honestly, I've long wandered, why bots wouldn't just craft and spam the AH. A small version of a global AH, really.